Jerry Griggs was born on August 2, 1936. He enlisted in the Aviation Cadet Program of the U.S. Air Force on August 6, 1956, and was commissioned a 2d Lt and awarded his pilot wings at Reese AFB, Texas, on February 21, 1958. Lt Griggs then completed Helicopter Pilot Training at Randolph AFB, Texas, in June 1958, followed by Combat Crew Training, before serving with the 55th Air Rescue Squadron in Greenland from August 1958 to July 1959. His next assignment was as an instructor pilot with the 3638th Flying Training Squadron at Stead AFB, Nevada, from September 1959 to December 1964. Capt Griggs served with the 1001st Helicopter Squadron at Bolling AFB, Washington, D.C., from December 1964 to August 1967, and then completed conversion training in the HH-3E Jolly Green Giant before serving with the 37th Aerospace Rescue and Recovery Squadron at Da Nang AB in the Republic of Vietnam from December 1967 to December 1968. 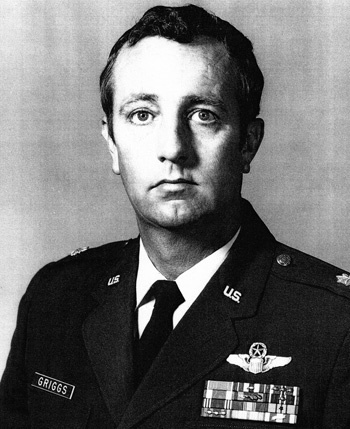 Maj Griggs then transferred to Elmendorf AFB, Alaska, where he served with the 21st Operations Squadron, the 5040th Helicopter Squadron, and on the staff at Headquarters Alaskan Air Command from December 1968 to June 1973. His final assignment was flying B-52 Stratofortress bombers with the 62nd Bomb Squadron at Barksdale AFB, Louisiana, where he served from July 1973 until his retirement from the Air Force on February 28, 1978. The President of the United States of America, authorized by Title 10, Section 8742, United States Code, awards the Air Force Cross to Major Jerry M. Griggs for extraordinary heroism in military operations against an opposing armed force as Rescue Crew Commander of an HH-3E helicopter in Southeast Asia on 30 March 1968. On that date, Major Griggs flew over hostile territory in low overcast weather to reach the survivors from six American helicopters which had been shot down by hostile fire. After his aircraft received substantial battle damage from intense opposing ground fire, Major Griggs, with undaunted determination, indomitable courage, and professional skill, persisted in the rescue attempt until he rescued four survivors, although he sustained further battle damage from the intense hostile fire. 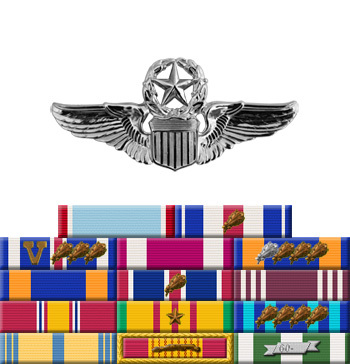 Through his extraordinary heroism, superb airmanship, and aggressiveness, Major Griggs reflected the highest credit upon himself and the United States Air Force.